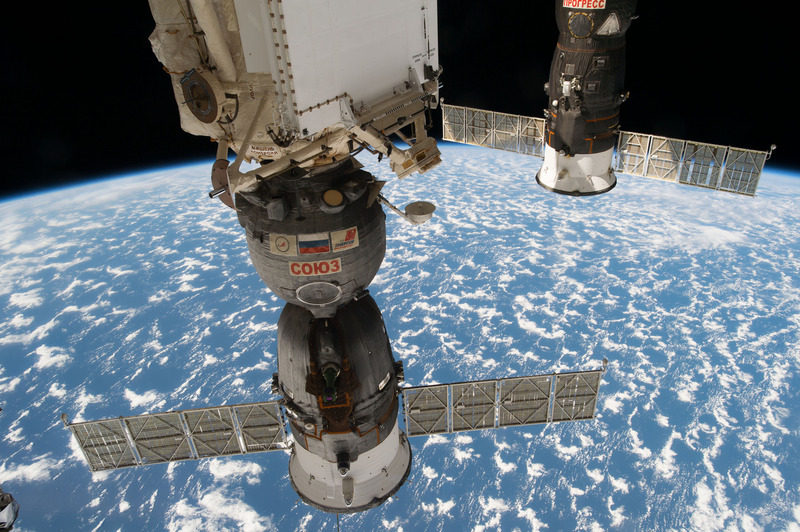 The Soyuz MS-03 crew ship (foreground) and the Progress 66 cargo craft are pictured as the International Space Station orbits about 250 miles above Earth. International Space Station managers will meet Sunday morning to discuss a forward plan for dealing with the apparent failure of one of two fully redundant multiplexer-demultiplexer (MDM) data relay boxes on the S0 truss of the complex. External MDM-1 apparently failed at 1:13 p.m. Central time Saturday. Multiple attempts by flight controllers to restore power to the relay box have not been successful. Troubleshooting efforts are continuing. The Expedition 51 crew was informed of the apparent failure and is not in any danger. The MDMs on the truss control the functionality of the station’s solar arrays and radiators among other equipment, and provide power to a variety of other station components. Because the two MDMs have full redundancy, the apparent loss of MDM-1 has had no impact on station operations. oh my god, that’s our earth?? it’s awesome..